Thanks to iThoughts for sponsoring Macdrifter this week. iThoughts is my go-to context mapping software because it works and does so much more than make a pretty map. This article is about a sponsor's product. All of the ideas and words in this article are mine. I use iThoughts every day. I use more than almost any other app on my iPad. I also use it on my iPhone and Mac and sync everything through Dropbox. It's amazing. 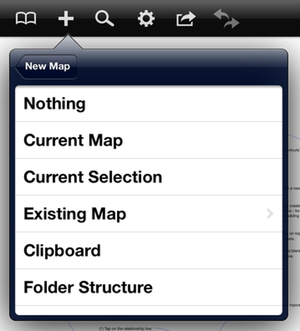 iThoughts for iOS and Mac are not just about making beautiful context maps. They are utilities for getting your ideas down and then out to somewhere else. If you've never explored the file import and export options in iThoughts, then you are in for a treat. While iThoughts is a joy for quickly getting ideas and information into a structured layout, sometimes circumstances dictate another app or format. For example, I also like to work in plain text lists and so do my collaborators. That's not a problem with iThoughts. 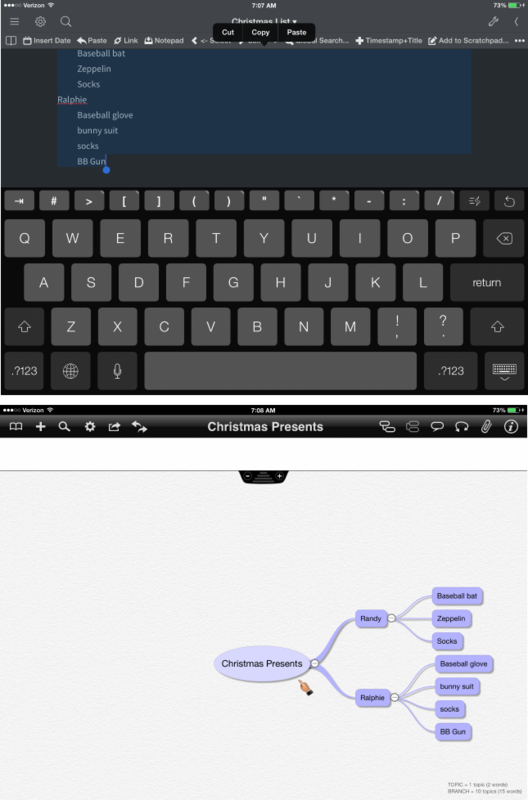 I create a plain text outline in any other iOS app and then copy and paste into iThoughts. The lines are automatically converted to new nodes and indents are evaluated as child nodes. If I'm working in an outlining app on iOS that supports OPML export, such as OmniOutliner, it's extremely easy to generate a new context map in iThoughts. I use the Send to App... function and the OPML document directly to iThoughts, which is automatically converted to a new context map. 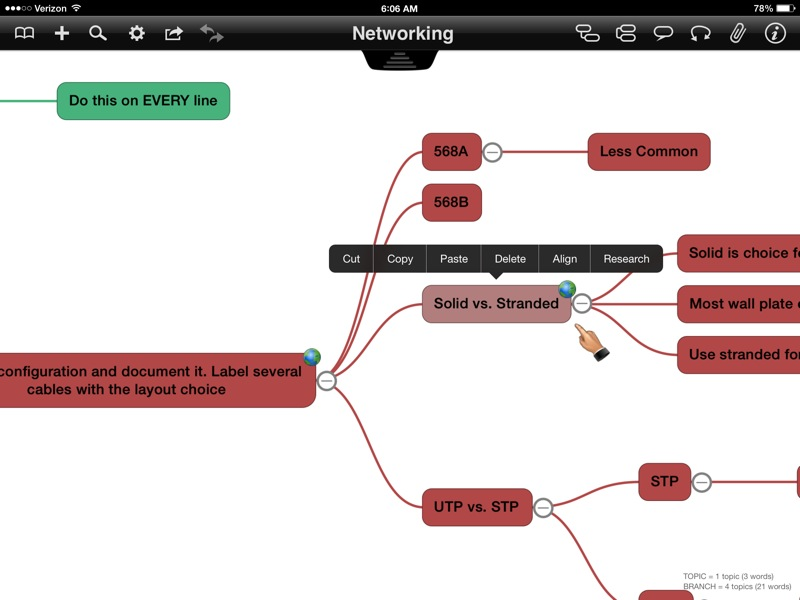 With support for hyperlinks and text notes on each node in iThoughts, it also makes a great research tool. Research mode is an in-app browser with customizable search engines (configurable in the settings app). The browser opens and immediately performs a search on the topic text. Tap and hold on a link to add it to the currently open map. Or tap and hold on an image to insert it as a new topic or floating image. If you prefer to work in another browser like Safari or iCab, just add an iThoughts bookmarklet to instantly send the current page as a new node on the iThoughts pasteboard. The bookmarklet leverages the iThoughts URL scheme to create a meaningful link with both the link and title. iThoughts provides a long list of formats for exporting data from a context map. Of course, it supports the basics like OPML, plain text and images but there are also some really clever options for turning a context map into something that you can share with anyone. Select a map and export either the entire map or just a selected branch. Choose one of the many available export formats and check the option to send the new file to any app. 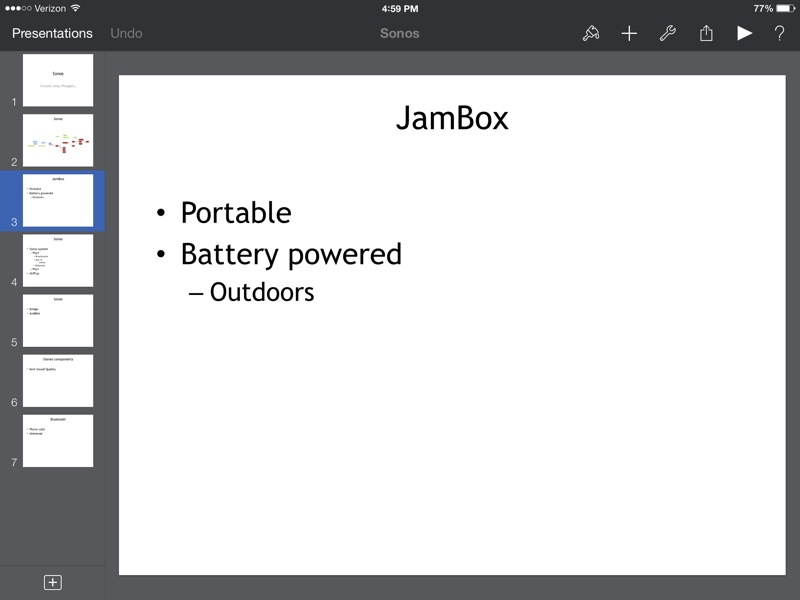 For example, convert a map to an MS Powerpoint file and immediately open it in Keynote on iOS. 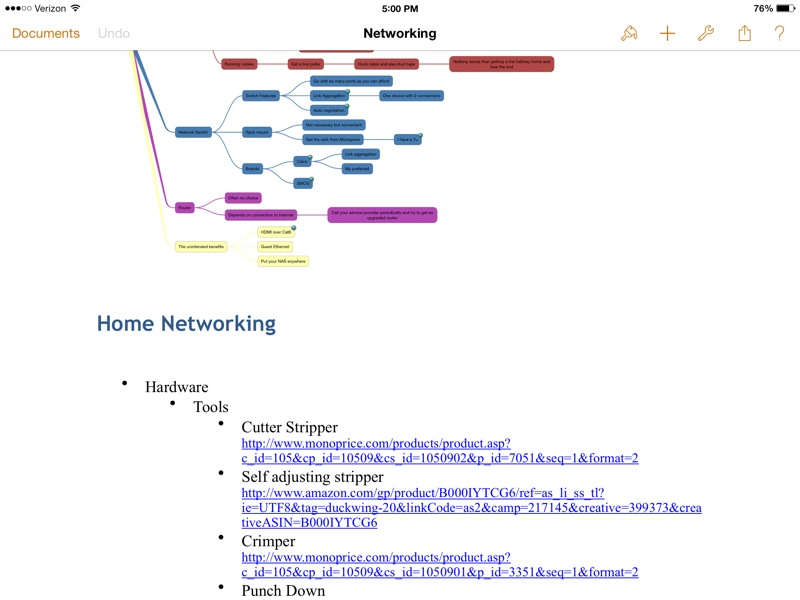 Not only does the Powerpoint file contain the original map as an image but each second level node is converted to a new slide with a bullet list of the child elements, complete with links and images. Exporting to an MS Word document is just as great. An image of the original map is included but so are all of the links, which are live when viewed in Pages for iOS. And if you want to get your data back to an outliner like OmniOutliner, choose OPML format. 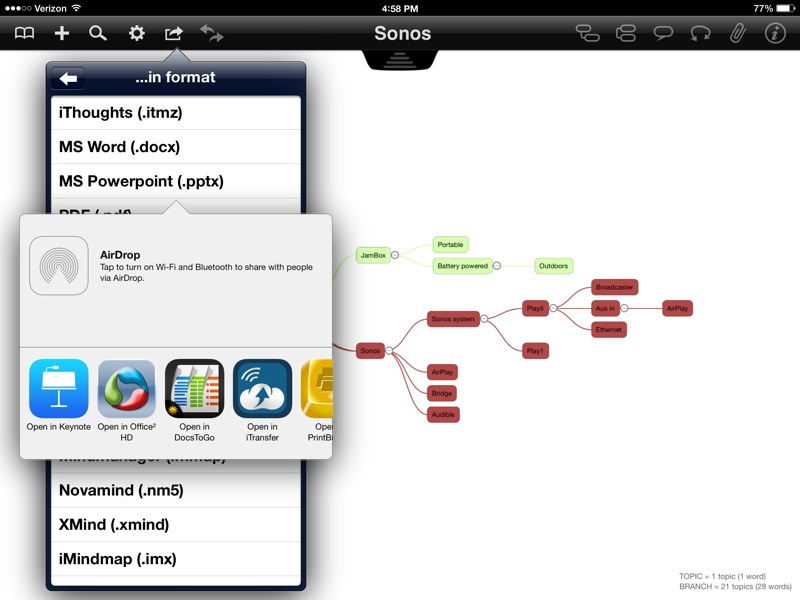 The export from iThoughts includes the map hierarchy and embedded links. This is a great way to make a round trip between an outliner and iThoughts. Markdown export from iThoughts looks great. Send directly to any app that registers to support a Markdown file. Links are properly formatted and so are the headers and child elements. With a great user experience and powerful import and export options, I'm glad that iThoughts is available on my iPad, iPhone and Mac. With Dropbox making up the backend syncing solution, it's no wonder I use iThoughts everyday for small lists to large project plans. If you haven't looked at iThoughts it's well worth your time and money.